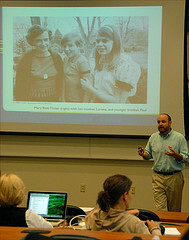 Mr. Hiestand coordinates many of his speaking engagements with the Student Press Law Center. In such cases, the SPLC compensates him for his speaking and travel time. For other speaking engagements, Mr. Hiestand generally charges $50/hour to a maximum of $250/day (inclusive of travel time) when speaking to students, teachers and other nonprofit groups. (For speaking to commercial, for-profit groups, please contact him directly.) In addition, hosts are required to pay for all reasonable out-of-pocket travel expenses associated with the speaking event. (1) Transportation costs to and from Zenger Consulting's Bellingham, WA -area office, including, where necessary, local ground transportation to/from departure location and at destination. One-way trips of less than 25 miles from Bellingham, WA: No charge. One-way trips of between 25 and 150 miles: Use of a personal vehicle, a taxi, local public transportation or train is usually preferred. Where a personal vehicle is used, the mileage reimbursement rate is, as provided for by IRS regulations, 57.5¢ per mile. One-way trips between 150 and 300 miles: Transportation options include: (a) rental car, (b) train or (c) air travel. One-way trips in excess of 300 miles: Such trips are usually limited to air travel. Where applicable, tolls/ferry costs en route and parking fees at the destination shall also be reimbursed. Rental car: Compact car rental from a national car rental agency plus fuel charges. Since rental cars are charged by the day and sometimes also by the mile, the car may be rented the night before or returned the morning after the completion of the trip if it does not exceed the term of the rental. Train: Roundtrip coach class travel from Amtrak Station, Bellingham, WA. Air travel: Roundtrip coach class, economy fare travel on a regularly scheduled commercial flight from Bellingham, WA International Airport (BLI). Travel from Seattle-Tacoma International Airport (SEA) or Vancouver, BC (YVR) will be considered, but will generally entail additional ground transportation and/or airport parking charges charges of apx. $12.00/day. Ground Transportation: Transportation to and from airports (or train station, etc.) and Zenger Consulting office or destination hotel and/or event site. Transportation can include personal vehicle, taxi, airport van service or rental car. Unless otherwise stipulated, transportation arrangements will be made by Zenger Consulting. Includes reimbursement for a single, non-shared hotel/motel room with a private bathroom for all nights in destination that are required because of speaking event or travel arrangements. Where applicable, the following hotel charges are also reimbursable: tax, hotel parking fees, telephone/Internet charges of up to $5 per day. The speaker does not expect hosts to reimburse the following charges: in-room movie/entertainment charges, mini-bar charges, hotel recreation or entertainment charges not included in standard hotel rate. Unless otherwise stipulated, the host will make lodging arrangements. A reservation number as well as address and telephone number for the hotel should be provided to the speaker at least 72 hours prior to departure. Normally, the room charges should be billed directly to the host. If that is not possible, please be sure to notify the speaker that he should pay for the room and submit the bill along with other reimbursable travel expense receipts. Includes meals, beverages and tips while traveling or at destination, not to exceed $40 per day. As a nonprofit organization, the Student Press Law Center fully understands the financial constraints faced by most student and educator groups. The SPLC and Zenger Consulting have become quite savvy traveling on the cheap over the years and are happy to work with you to find the least costly and most time-efficient method of travel. On request we can provide the host with estimated travel expenses before purchase. The speaker will provide you with an itemized list of all reimbursable travel expenses. Receipts will be provided for individual expenses over $25. We request that you issue payment within ten business days of receiving the speaker's expense list. Payment should be made payable to "Zenger Consulting," clearly noted as "Reimbursement for Travel Expenses," and mailed to: Zenger Consulting, P.O. Box 743, Ferndale, WA 98248-0743. An IRS W-9 Form can be provided upon request. Once a request for a speaker has been accepted and confirmed, if you cancel or reschedule the event, you must provide written notification to the speaker immediately. You will be responsible for reimbursing Zenger Consulting for any non-refundable travel expenses that the speaker has reasonably incurred up to that point. Purchase of travel insurance (typically 5-10% the cost of the trip), added to the cost of an air ticket, is recommended to cover cancellations in the event of speaker sickness or other unforseen impairment. If you choose to waive the purchase of such insurance, you will be responsible for non-refundable expenses in the event the speaker must cancel due to a traditionally covered event (sickness, family emergency, etc.) The speaker will be responsible for covering such expenses in the event he or she must cancel due to a reason or event not traditionally covered.